You can find my fall/winter tips for fighting the frump here. 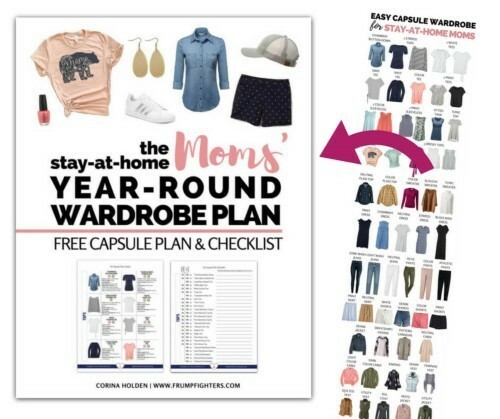 You can find a free spring/summer wardrobe plan for moms here. I'm so excited to share this post. Can you believe it took me upwards of 5 hours to put it together? And it's not because I'm an airhead! Planning outfits, taking photos, editing, resizing, creating graphics and then finally writing posts takes SO long. Like, for real! I never thought blogging took this long until I dove in. But I think the work has paid off. Here are the rules that this fashion blogging journey has taught me along the way. Do you love wearing skirts in the spring and summer? I certainly do! They help me stay cool but also feel super feminine. But if you don't pair them with the right top and accessories, you can end up looking frumpy. When wearing a flowy skirt, pair it with a fitted top. When wearing a fitted skirt, you can pair it with either a fitted top OR a flowy top. I recommend partially tucking or belting a flowy top. Hover over the graphic below to pin it for reference! This is the most common mistake I see moms make: wearing tennis shoes (running shoes) when they aren't working out. Often you'll see a perfectly cute outfit that's ruined by the addition of ratty old sneakers. There's a simple and just-as-comfy solution: buy a pair of on-trend slip-on sneakers. They completely lift an outfit! And a good pair can be just as comfortable. Here are some cute slip-on sneakers available on Amazon Prime. Hover over the graphic below to pin it to your style board! Tunic tops are trending right now, and I personally LOVE them! Tunic tops are basically extra long with a "relaxed" fit... the epitome of comfy! However, they can look frumpy if not paired with leggings or ultra skinny jeans (remember Rule #1 about proportions?). Equally problematic are baggy, shapeless dresses. An easy fix for this is simply to add a belt at the natural waist. I love wide elastic belts and skinny colored belts! Here are some awesome belts available on Amazon Prime. Their more feminine counterparts are just as comfy and will flatter instead of frumpify your appearance. (Isn't frumpify an awesome word?!) Look for cute details like ruching, crochet, or lace and fun patterns like aztec, polka dots, or floral. Just as important as the pattern details is the FIT. Modesty is a big priority for me. But I've learned I don't need to compromise on fit just to be modest. Something can fit you well without being tight. I just adore these feminine tees on Amazon. So many cute patterns! Hover over the image below to pin it to your fashion board! Rule #5 Add character to boring outfits by accessorizing with jewelry, a vest, or a belt. Try tucking in shirts to show off a fun belt (either a full or partial-front-tuck works!). Use a light vest with a crochet knit or sheer fabric to add a weightless layer (denim vests are also great if it's not too hot out). Jewelry like pendant necklaces, minimalist or statement necklaces, big earrings, bracelets, or headbands also add some variation to summer outfits. Fashion sandals like these on Amazon will go a long way to bring an outfit to life. Don't forget to pin this tip too! Now it's your turn to share... did I miss any common frumpy mistakes made by moms? Which of these rules do you want to start applying right away?